Evergreen shrub or small tree, to about 20 ft (6 m) high and somewhat less in width, branches tomentose (dense matted hairs). 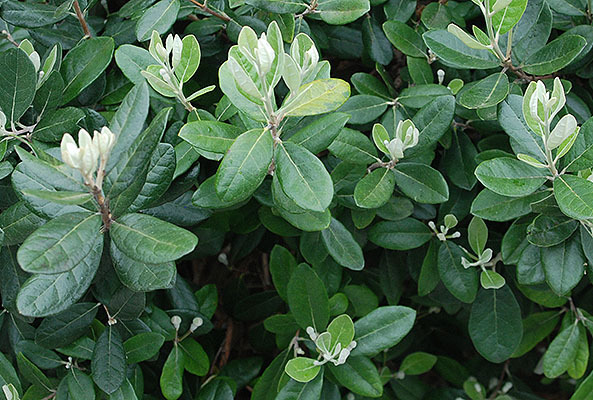 Leaves simple, opposite, elliptical to ovate, 3-8 cm long and 2-4 cm wide, margin entire (smooth), apex obtuse, base rounded, glossy dark green above, silvery-white tomentose below. Flowers single, in lowest 2-4 leaf axils of current season's growth, 3-4 cm wide, 4 whitish petals with red centers, 4 sepals and numerous carmine colored stamens, yellow anthers, edible. Fruit ovate, 5 cm long, yellow-green to blue-gray, edible, pulp juicy, greenish white, tastes likened to pineapple with spearmint overtones or somewhat pear-like; may take 4-7 months to ripen, depending upon climate. Sun to light shade, well drained, loamy soil. 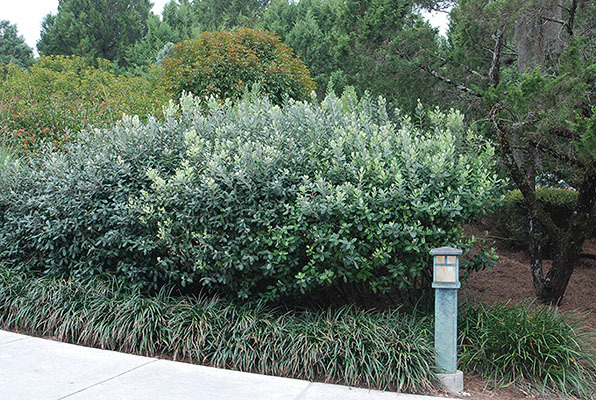 Tolerant of drought and salt winds, used as a hedge in coastal garden in mild climates. Habit is loose and open, rather dense if pruned. Can withstand much pruning and training (espalier, screen, hedge, or small tree). Hardy to USDA Zone 8 Native to southern Brazil, Uruguay, Paraguay, and northern Argentina. Several cultivars available. 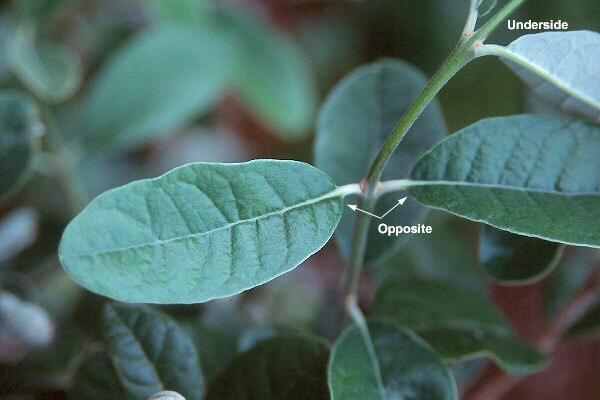 Cultivars such as 'Beechwood', 'Coolidge', 'Mammoth', 'Nazemetz' and 'Trask' are self-fruitful, but reportedly cross-pollination will result in more fruit. Single plants derived from seedlings or other cultivars may need cross-pollination (Sunset Western Garden Book, 2001). 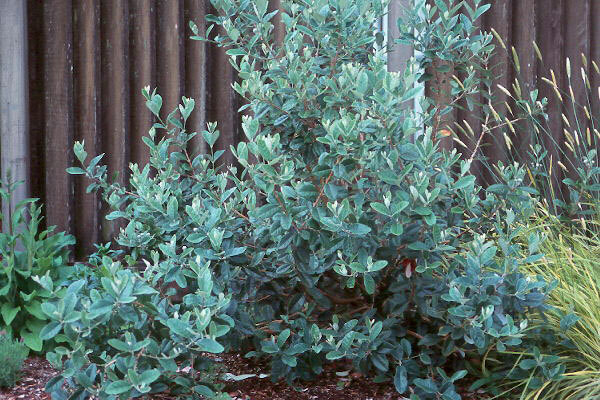 The plant has long been called Feijoa sellowiana but apparently this name has been incorrectly applied since 1941. 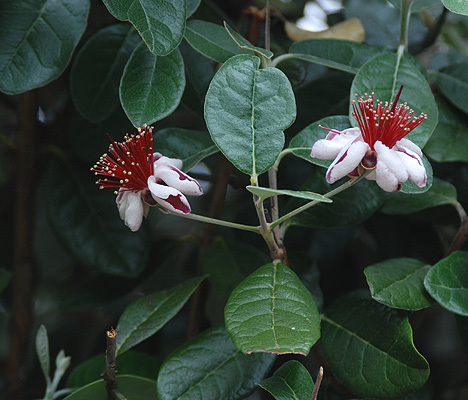 The German botanist Otto Karl Berg (1816-1866) first described this plant as Feijoa sellowiana in 1859, naming the genus after João da Silva Feijó (1760-1824), a Portuguese naturalist born in Brazil. 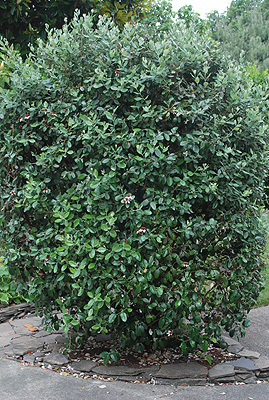 In 1856, three years prior, Berg had given the name Acca domingensis to another South American plant in the Myrtaceae. 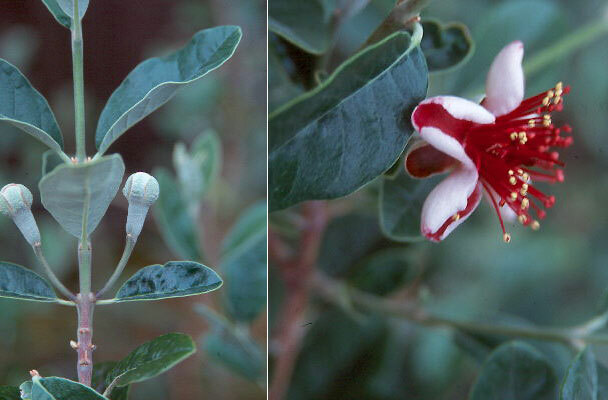 In 1941 Karl Ewald Maximilian Burret (1883-1964), a German research botanist combined these two genera, so the valid name of this plant is Acca sellowiana. Oregon State Univ. campus: northeast corner of Finely Hall (dorm) (Washington Way).